The Geekvape Creed RTA is one of the most versatile tanks on the market, offering a choice of three interchangeable airflow chambers so you can truly personalize the flavor and warmth of your vape. 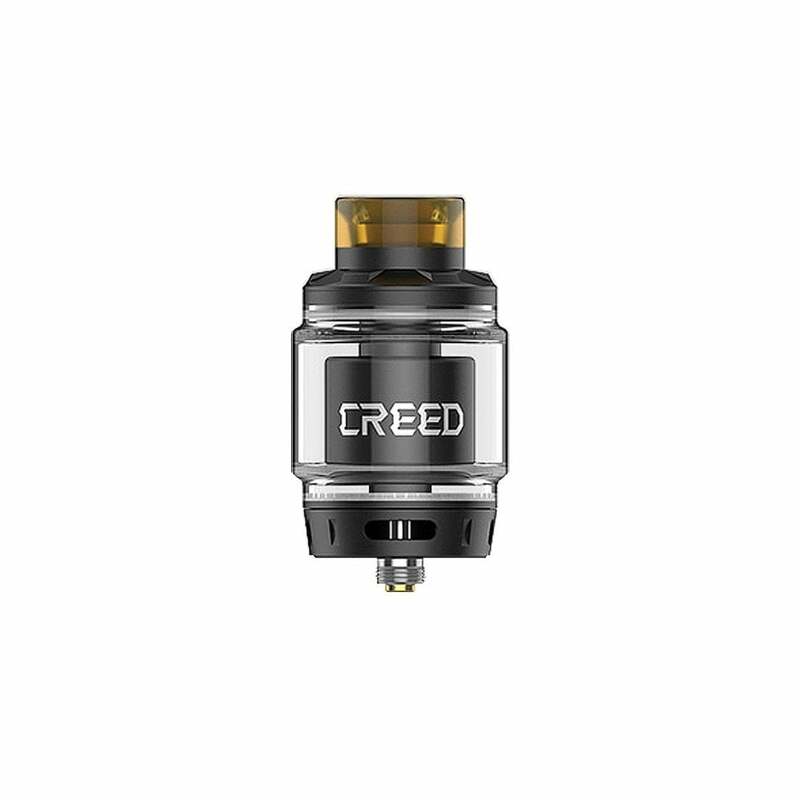 The Creed RTA by Geekvape is easy to build on and can be used for both single and double coil builds. With a 25mm diameter, the tank is perfectly sized for use with most modern mods, and comes with a bubble glass section that holds 6.5ml of your vape juice of choice. You can fill up your Geekvape Creed RTA by unscrewing the top cap and squeezing your vape juice through the filling slot. The Geekvape Creed’s interchangeable airflow system lets you choose between three different airflow chambers, each of which is suited to a different vaping style and different coil builds. The airflow chambers included with the kit are: a straight bottom airflow chamber; a chamber with side slots; and a chamber with side holes. You can adjust the airflow using the ring at the base of the tank to choose between an airier draw or a more restricted vape. If you’re looking for a highly customizable vaping experience with outstanding flavor and thick clouds, the Geekvape Creed RTA is one to try. Please note: RTAs and other rebuildable atomizers are intended for use by intermediate and advanced vapers only. I've been through my fair share of RTAs over the years. The Creed is easily one of the best. Took a couple tries to get the coils lined up correctly in the post holes, but once I got the hang of it I didn't have any problems. Great flavor and airflow. Definitely gonna buy a few more of these to have on hand.